None could love it more. IT must have been a drought year when the first Hottentot tribes migrating southwards gazed on the Great Karoo for the first time. They named these plains Garob, meaning dry, unfruitful, uninhabited. Pioneer white farmers corrupted and used the Hottentot name, so that in documents of two centuries ago you will first discover the words Carro and Karoo. In the karoo you may find children of five who have never seen rain. Yet this killing climate also holds great healing power. A karoo farmer, you will remember, invited a dying King of England to rest his stricken lungs in that buoyant air. 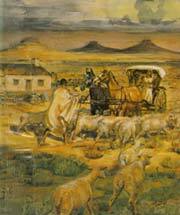 Many have gone to the karoo under the cold sentence of death and returned to live beyond the three score years and ten. Karoo is a wide term covering more than a hundred thousand square miles in its widest meaning. Within that area are the strangest possible contrasts . . . the huge daisies called gousblomme making a wonderland of the veld for miles outside Beaufort West . . . away to the west in the Calvinia district many farms are deserted and the sheep farmers are searching Namaqualand for grazing. There are, in fact, many karoos in South Africa, and they form the most spacious plateau region in the world outside Asia. Nearest to the coast is the Little Karoo, no desert nowadays but rich, narrow, irrigated valleys shut in by wild mountains, the Swartberg and the Outeniquas. Climb over the Swartberg by the most sensational pass in South Africa and you come to the desolate expanses of the Great Karoo. I suppose the Great Karoo proper, bordered by mountains with six and seven thousand foot peaks – the Cedarberg, Swartberg, the Roggeveld and Nuweveld – has an area of no more than roughly thirty thousand square miles, perhaps five times the size of the Little Karoo. Yet it is hard to say where the Great Karoo ends. It merges into the high northern plains of the Cape, and much of the Orange Free State is spoken of as karoo. It sweeps across relentlessly to the northwest, to Sutherland and the Roggeveld and Hantam; and beyond, even in Namaqualand, you are still in true karoo sheep country. Often the only visible boundary in the Great Karoo is the horizon. "I am like an eagle," an old farmer told me. "I look all round and see no one, not even the smoke of a neighbour's chimney. That is why I love the Great Karoo."